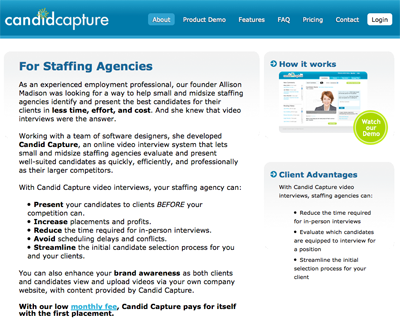 This startup online video interview company originally planned to target only staffing firms. Upon further discussion with the client, it was determined that corporate Human Resources Departments were equally attractive prospects, but they had different needs from the staffing agencies. 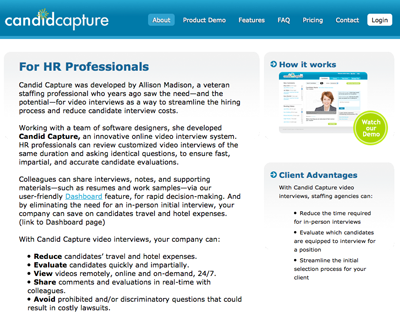 We recommended adding two pages to the client’s website that highlighted the distinct benefits of Candid Capture to each target audience. The client agreed with our suggestion, added the pages to their website, and based their online product demo on our copy.